Part of the multinational Pierre Fabre Group, Elancyl is an innovative brand specialised in slimming and body care products. Since 1971, Elancyl assists women in their quest for the ideal figure providing targeted care, with unique efficacy and safety guaranteed by the meticulous nature of a dermocosmetic laboratory. Elancyl products are sold worldwide online and offline by parapharmaceutical retailers and pharmacies. In order to boost its sales and to direct qualified leads to its resellers, the brand has now deployed Swaven’s multi-retailer POP (Point Of Purchase) solution on its website in France. The pharmaceutical sector has a specific legislation in France and brands selling their products in pharmacies have to comply with the national regulations in terms of marketing. Swaven has taken these rules into account in its shoppable services and is now fully prepared to accompany brands in the parapharmaceutical sector in the objectives to increase the performance and the business impact of their digital marketing activities. Elancyl powered its website with Swaven’s shoppable solution. On Elancyl’s brand website, visitors are provided with plenty of information and advice on skin rituals with complementary products. For each product, a ‘buy this product’ button is provided. By clicking on it, a list of online and offline resellers appears based on the user’s geographic location. Users can narrow down the results by adding or removing criteria such as home delivery, click-and-collect, or buying in store. Additionally, Swaven solution provides a link to find all available resellers of the brand, a mandatory condition for all brands of the Pierre Fabre Group. 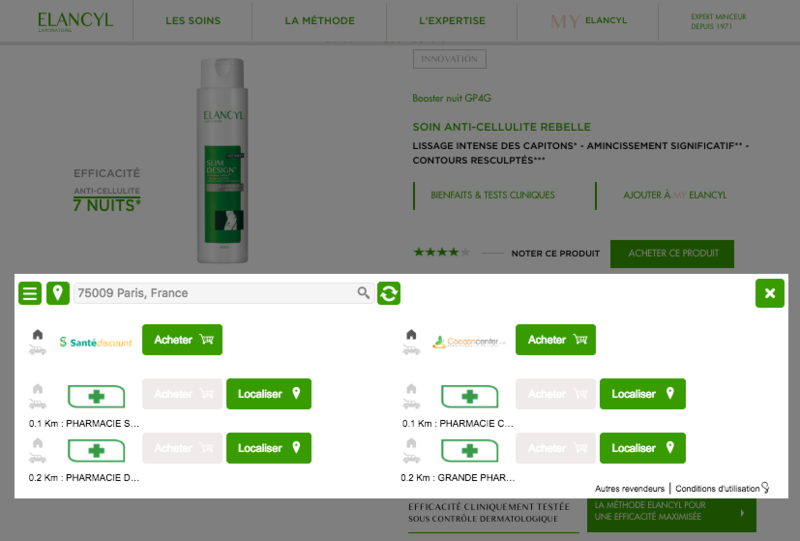 In one click, the user gets to the product pages of his/her chosen online retailer to purchase the product or checks the itinerary to the closest pharmacy selling it. Deploying Swaven’s solution on their website allows Elancyl to generate qualified traffic to its resellers, and thereby to increase the sales of its products. Given that on each click 30% of audience is lost on average, reducing steps to purchase from 9 or 12 clicks to 2 clicks makes a huge difference in the conversion funnel. More potential customers are directed to purchase options. Offering both online and offline retailers to the visitors also increases the conversion potential because the users can choose their preferred stores based on their personal buying habits. The POP solution allows brands also to collect statistics on the shopper paths by acquisition channel. This helps brands to analyse which campaigns generate the most of potential leads and which products and retailers are the most searched for. Swaven’s platform is designed to help marketers evaluate and adjust their marketing investments according to concrete data showing which activities have the best impact on the brand’s business growth.